Calendula & Concrete: First Zucchini! My first zucchini is here! Ta-dah! OK, I realize the more experienced gardeners among you are probably thinking: What's the big deal? 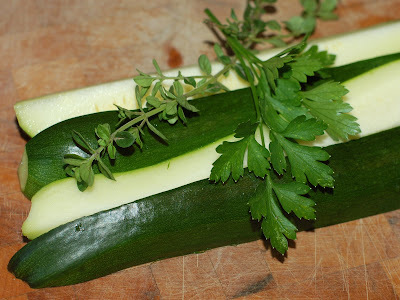 Zucchini is notoriously the easiest vegetable to grow in large quantities. Most people have trouble finding enough ingenious ways to give it away. If you've been following my blog, though, you know I had to deal first with the yellowing leaves and split stem, and then the implementation of the Band-Aid patch-up job. It worked! Michael and I were out at the plot a few days ago and I squealed at the sight of two tiny zucchinis forming at the heart of the plant. On Wednesday, I went back to take photos and found one zucchini already large enough to pick. Fast growers, they are indeed! 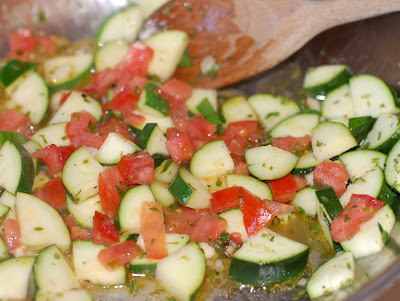 I grabbed a few herbs -- parsley, oregano, and oregano thyme -- to accompany my zucchini in a celebratory dish. I diced the zucchini and marinated it for a few minutes in lemon juice, olive oil, garlic, salt & pepper, and the chopped herbs. With a few dices of farmers' market tomato, I sauteed everything just long enough to heat through. Then I put it all together with orzo pasta and one final flourish of parsley-confetti. With all the herbs in this, it tasted like pasta with marinara sauce, without the actual sauce. So flavorful, so simple, and just... so good. I'm now looking for ideas on how to cook all the zucchinis I hope are yet to come. Michael asked if we could let at least one of them grow to be gigantic, so we can make the requisite zucchini cake. The rest I'm going to try and harvest when they're small. I'm looking forward to trying Aunt G's zucchini pie and some zucchini fritters, among other recipes. This post is part of Weekend Herb Blogging, hosted this week by Astrid at Paulchen's Food Blog. Check her blog on Monday for a roundup of herb- and veggie- themed posts from all over the world. Your zucchini recipe looks great. I haven't had zucchini in ages. But casting my memory back, I'm sure I've got a zucchini and nut bread recipe kicking around somewhere. And so what if zucchini is easy to grow. All the better I say. Cool. I don't have any zucchini yet, in fact when I left SLC one of my zucchini plants was looking sickly. I hope it's not dead when I get home. Congrats on the first zucchini of the year! It's beautiful! AND it looks delicious! You have me regretting not planting any. that's awesome! It is really early for zucchini too. My favorite way to eat zucchini is making bread out of it. YUM! Zucchini is one of my favorite veggies! My confess I greet the first zucchini of the year with slight dismay. Thinking up new recipes is a major challenge! 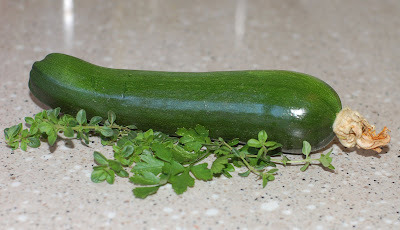 That's a fine looking zucchini. I've made zucchini bread...here's a recipe if you fancy trying it.. Put zucchini in strainer and press or squeeze with hands to get excess liquid out. Beat eggs, sugar and oil together. Add flour, baking powder, baking soda, cinnamon, salt, vanilla, walnuts and raisins. Mix together. Add drained zucchini. Mix well. Pour into 2 greased and floured loaf pans. Bake 1 hour at 350 degrees. Congratulation to your zucchini! We had it with pasta this week. It might not be too late to plant zucchini in Chicago. It grows fast! I definitely want to cook some of the blossoms. Squid ink??! That's a new one for me. What does squid ink taste like? Your zucchini bread sounds FANTASTIC. Thanks so much for sharing your recipe! Your pasta dish is making me hungry. The combination of zucchini with fresh basil and nuts sounds delightful. Thank you for sharing your recipe, too. I love zucchini and your pata looks georgeous! 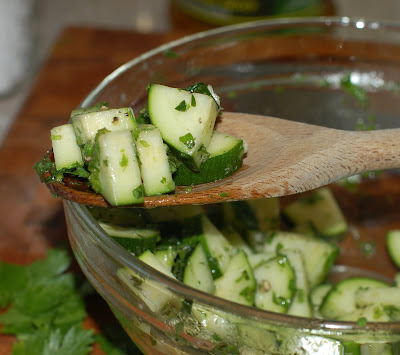 Great zucchini recipe ... it looks so delicious. I'm off to check out the weekend herb site you posted. It's tea thyme In My Canadian Garden for Green Thumb Sunday. I love zucs and also am delighted when the first appear. Sadly I didn't plant any this year as hubby isn't a fan. I love the zuc cake with pineapple icing. I had to come back and share the cake recipe as it is really my favorite cake. Cool to ice. For icing mix all frosting ingredients and refrigerate for 1 hour while cake bakes and cools. "Southern Living Magazine- June 1995 issue"
Really, I love to slice it thinly, drizzle with fresh lemon juice and sprinkle with fresh black pepper. I then take it out to the BBQ and grill it in this metal basket thing. Or, sometimes I just eat it raw. And sometimes, it's the perfect thing to quarter and add as part of a kabob. Now that is exciting ... I remember clearly your band-aid solution so this is even more of a coup! The resulting meal looks delicious ... I'm looking forward to seeing more as your crop ripens and you are overcome with zucchini. My favourite way to eat zucchini is in muffins or cake ... I shred all the zucchini that comes my way an freeze it in 2-cup bags and have zucchini muffins all winter long. Zucchini chocolate cake is scrumptious and easy to make. I like to eat them sliced thinly,marinated over night and grilled on the BBQ! that zucchini and pasta looks delicious! I haven't gotten any zucchini in my garden yet. They seem to be growing slow for me this year. I just tried a zucchini fritter recipe, it was delicious! They are also good simply grilled. /We are gardening for the first time this year and have been getting almost more zucchini than we can handle! I'm not complaining though - the easy success really helps our confidence and morale in the garden. Our favorite is recipe is to grill them brushed with olive oil and sprinkled with herbs. Simple but very good. Wow! Thanks, everyone, for sharing all these great ideas. I want to try every one! Pineapple is one of my favorite fruits. Thank you for taking the time to write down the recipe for Zucchini Pineapple Cake. I am definitely going to try it. The grilled zucchini is definitely getting high marks. I don't have a BBQ grill, but I think I can manage something similar on the indoor grill pan. Love the kabobs idea, too. Thanks for delurking to share your favorites. Stuffed zucchini sounds like a great way to go if I get one (or a few) that start growing enormous. I see lots of zucchini baked goods in my future. Kate, I love your suggestion of freezing measured portions of it. Zucchini muffins made in the dead of winter would be delightful! The orzo dish looks so fresh and delicious. It is making my mouth water. I'm going to get something to eat. Your zucchini dish looks DEE-Lish! I don't grow zucchini anymore because of space issues but hope to next year when I add a few more garden beds. 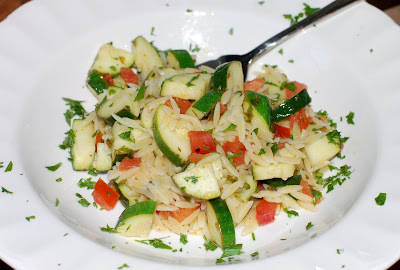 I have a recipe for a Zucchini Rice salad that is very good. Our fav way to prepare zucchini is sliced in rounds and sauteed with loads of sliced garlic and finished with good salt and pepper.